The Smith and Sindelar families present a check to Akron Children’s after raising money in memory of Kyle Matthew Smith who passed away in March. In February, Elizabeth Smith’s 2-year-old nephew Kyle Matthew Smith passed away from myotonic dystrophy, a type of muscular dystrophy. The Smith and Sindelar kids made a sign and stood on their street corner to raise money. 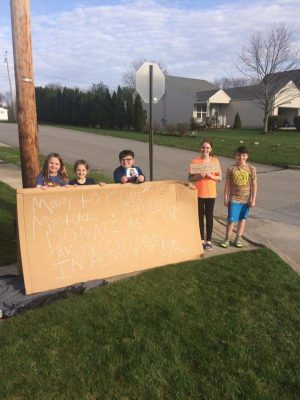 Elizabeth’s children, Ellie, 11, Emma, 8, and Eva, 7, made cardboard signs that read “Fundraiser for Akron Children’s Hospital in honor of Kyle Matthew Smith to support myotonic dystrophy” and stood on their street corner with 2 of their neighbors, Gavin and Brayden Sindelar. Ellie, Emma and Eva collected donations at the corner for several days and went door-to-door too, offering baked goods Ellie had made in exchange for donations. Elizabeth shared her kids’ fundraising efforts on Facebook. Her uncle commented on the post and told her whatever the kids raised, he would match. Ellie, Emma and Eva decided their goal would be to raise $250 and then have Elizabeth’s uncle match it for a total of $500. “Well, after 8 days they made it to $750 and my uncle kept his word and brought over a check for $750,” Elizabeth said. 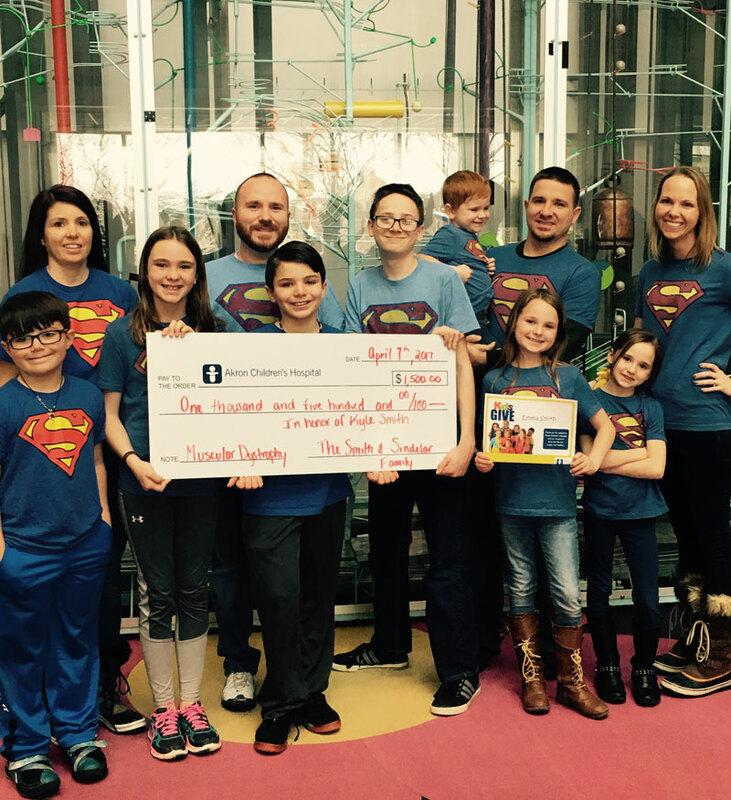 The Smith and Sindelar families came to Akron Children’s for an official check presentation of the $1,500 they raised, which the kids thought was really special.